Does "Finding Room Temperature" = Another Upset for the 2018 Steelers? Loyalty vs Rationality: Does “Finding Room Temperature” = Another Upset for the 2018 Steelers? Just a week ago you could muse that the Steelers might be on the verge of a breakout without risking being labeled as a hopeless homer. 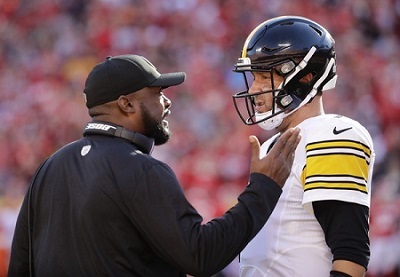 I did just that, asking if the Steelers recent troubles signaled that the team was regressing to the mean or if perhaps, Pittsburgh was primed for a serious playoff run. The loss to the Oakland Raiders show the Steelers as a team regressing to the mean. “Regressing to the mean” is a nerdy statistical term that doesn’t seem to belong in a football blog. So a more illustrative way to think of what is going on is that the Steelers started the season morbidly cold, got red hot in October and early November, but are now finding room temperature in December. And that’s what’s going on. One could reasonably look at the Steelers performances in September and imagine this team contending for a top ten draft pick. By the time November arrived, they looked like AFC Championship, if not Super Bowl Championship material. Now, outside of something extraordinary, they’re going to finish within spitting distance of .500. But what does finding room temperature really mean for this group of Pittsburgh Steelers? Does it mean that the Steelers will tease but ultimately lose to the New England Patriots and New Orleans Saints only to finish the season with a face-saving win over the Bengals? Or does the process of finding “room temperature” also imply that the Steelers have another upset in them? The way the Steelers have played, and more importantly, the plays they have chronically failed to make at critical junctures during losses to Denver, the Chargers and Raiders make it near impossible to trust this team. That doesn’t seem promising, does it? Yet, if already having dropped games to Oakland and Denver, it would almost seem like the odds favor the Steelers beating either New Orleans or New England. The Steelers positive performances would also seem to suggest that Pittsburgh is due for just one more fireworks display during this regular season. And that’s what makes the prospect of an upset remains tantalizing. Yet just a year ago, absent Ryan Shazier and absent Antonio Brown, Ben Roethlisberger, JuJu Smith-Schuster, Martavis Bryant and Le’Veon Bell came within a Jesse James replay recalled touchdown of beating the Patriots. And this Patriots team isn’t as good as last years. But does the prospect of Artie Burns and Cam Sutton replacing Coty Sensabaugh and Mike Hilton inspire confidence that Steelers will finally crack the Tom Brady to Rob Gronkowski riddle? No, it does not. And that’s what makes these Steelers so hard to predict. This entry was posted in Steelers 2018 Season and tagged Antonio Brown, Ben Roethlisberger, Cameron Sutton, Coty Sensabaugh, James Conner, Jesse James, JuJu Smith-Schuster, Martavis Bryant, Mike Hilton, Ryan Shazier, Steelers vs. Patriots, Stevan Ridley. Bookmark the permalink.